The Lions' Share: This is where you post for Blind Date with a Book! This is where you post for Blind Date with a Book! Blind Date with a Book @IMMS begins this week. We have limited blind date books available, so only check one out if you are willing to try something new and promise to at least read 30 to 50 pages of the book. After you read this amount you can "rate your date" here on the IMMS Lions' Share blog. Everyone who blogs about their book is entered in a raffle to win prizes. So what should you blog about the book? What about telling what you thought when you first unwrapped it? Did you ever read anything like it before? Would you have chosen this book? Write whatever you like. It's your experience to share! Be sure to post the title of the book. I think that this book, QB 1, was pretty interesting. When I got home to open it I was surprised to find that I already read this book. I knew that it sounded familiar, and even though I read it last year, I still remembered that it was a good book about how everyone deserves a chance and should not be judged. When I first got the book I was so anxious to open it. Then when I got home I was so happy until I opened the wrapping. It seemed odd I did not think that it was gonna be a good book. The book I had gotten is called "The Skin I'm In". I have read a couple of book like this one before and they were all interesting. I would have most definitely have chosen this book because it after reading only 10 pages I fell in love. I was very excited to try reading books that I honestly had no clue what were about and I think that with that being said I learned you can really enjoy something out of your comfort zone. The book I received was called " Born To Rock", I really enjoyed the book it was well written and easy to understand. I would definitely request this book to other scholars. Only after reading `5-20 pages you really get a good idea of all of the characters personalities and beliefs. I was so exited to open my blind date with a book I actually wanted to open it immediately , but I couldn't. The book I got was upside down in the middle of nowhere by julie T. lamana. I would rate the book a 5 star book.I would've chosen this book. When I opened the wrapping, the cover instantly caught my eye. I had never heard of it and when I began reading it, it became more and more interesting. I have never read a book about such a strong topic everyone has opinions about. "Goodbye, Stranger" will change your view on many teenage topics. I rate it 5 stars *****. I was surprised when I opened this book. I had no clue what it was going to be, but it turned out to be a book I have been wanting to read. I was slightly perplexed when I began to read, but then it all started to make sense and I realized how much of a great book this is. The book is "Divergent" by Veronica Roth. I would rate it Five Stars because of an interesting storyline and the style of writing. 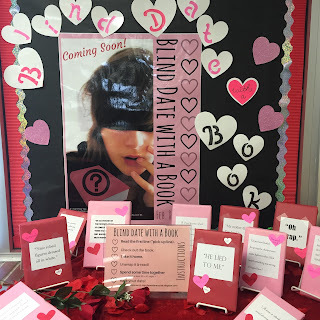 The blind book date challenge was very fun and interesting. The book I checked out was UNWIND. The book was three kids that were going to the same place to be unwound but escaped together but to get here they were headed. They only get there with the help of other strangers willing to break the law to save them. Josie S.
Me and have a lot in common. We both live in Texas. We both love crazy socks. But the most we have in common, we're both silly. But there is a bad thing we have in common. We're both bullied. A.M. I open the book after I took the wrapping off and then I looked at the book and did not think I would like it. So then I sat the book down. I came back later and I started to read it. I read 1, 2, 3, 4, 5, 6, 7, 8, 9, 10 pages the I read the whole book. It was great. Sabrena L.
When I first unwrapped the book I though it was going to be boring. When I started reading it, it wasn't boring at all. When I finished all thirty pages, I was wanting to read more. I remember in the first part that they were all trying on the pants they all fit in the pants. I'm surprised they could all fit in the pants. The book was funny too. I really liked it. I showed this book to my friends an they said that they wanted to read. From the looks of it the book must be pretty good too. Well then then I read it. This book was about a first born princess that wanted to run away because she was force to marry. So she and her friends did so. Now the prince was after her to be married because he wanted to know who she was so he followed her. Also and now an assassin is chasing her to kill her because she insulted her father the king. I got my Blind date book and I really wanted to open it. When I opened it, I looked at the cover and It looked kind of interesting. When I started to read it, I got bored instantly. I would Rate How Not To Be Popular a 1 star book.